If being vegetarian is healthy is a question I had on my mind for a while, ever since the first time I decided to get into vegetarianism and give this new eating approach a go. It didn’t end too well for me. When I first tried it, years ago, I wasn’t really concerned about the health benefits of it, it was more for moral reasons; only later on I learned that it also was supposed to be great for health. If you read books about becoming a vegetarian, some of the first things you will find out is that if you do, you are going to develop an incredible amount of energy and just feel great over all. I was convinced it was eventually going to happen to me too, but it was quite the opposite. Some of the first things that I noticed after I stopped eating meat was that I had a very hard time sleeping. Sleeping was never easy for me already, but after I stopped eating meat it became even harder. I was told it was withdrawal symptoms from meat products, so I just kept going along with it. But my energy levels kept dropping, I felt tired all the time and also I always felt hungry. Yet I am a very stubborn person, so I just kept blaming it on working too much and maybe getting older, even though at that time I was only 16. I started loosing a lot of weight, mainly muscle. Since I was a figure skater when I was younger, I’ve always been very athletic looking and never considered a thin girl. But after about a year of not eating meat, everyone was starting to worry, because all of a sudden I dropped about 20 lbs – weight I definitely couldn’t afford to lose. Two years went by. My sleeping problems escalated, I always felt exhausted and I got extremely depressed, I didn’t recognize my self when I looked in the mirror. Even though I ate a lot of vegetables and fruits my face color looked like I’ve been ill for years. Then, one day, I was in a cafeteria at my job at the time, and one of my friends was eating a roast beef sandwich, she offered me a bite and for some reason I agreed. I ended up eating half of her sandwich. After I ate I felt incredible, I hadn’t felt that good in a very long time. I started sleeping again, didn’t feel tired anymore and the color came back to my face. You see, I grew up eating mostly red meat and chicken at every meal, this was something my body was used to as I was growing up. Protein is quite essential, and as much as we try to substitute, I believe some people need to have the real thing. Vegetarianism – Simply Not For Me? A few years ago I tried being a vegetarian again and this time it lasted for 6 months. It was exact same story: hard time sleeping, no energy, muscle loss, and mood swings. I finally realized that being a vegetarian wasn’t for me. I really tried to convince myself that it is the right thing to do, but when I listen to my body, it tells me that I need to eat meat. Just recently I tried an experiment. I ate raw vegetables and a lot of them, every single time I sat down to eat. Guess what happened then: I developed a lot of energy even on the days when I wasn’t able to get enough sleep, I’ve been feeling like an energized bunny. Then it hit me, vegetarians develop a lot of energy not because they stop eating meat, but because they eat a lot more vegetables! This was just my story, but I know people who are the opposite of me. They grew up eating only plant-based diet, and if they try meat, they feel sick. So those people have to stick to the diet that works for them. In the end, every single person has to listen to their own body. Eat, see how it makes you feel and if you feel great after eating certain things, then that is what works for you. If you get stomach cramps, bloating, etc, then that food is not for you. I personally admire the vegetarian approach for the moral reasons, because most people who are vegetarians do it out of these concerns. As far as health goes, I believe as long as we eat meat that is raised without usage of hormones, antibiotics and comes from animals that are humanly treated, then it’s healthy to eat meat. Just make sure you also add plenty of raw vegetables. 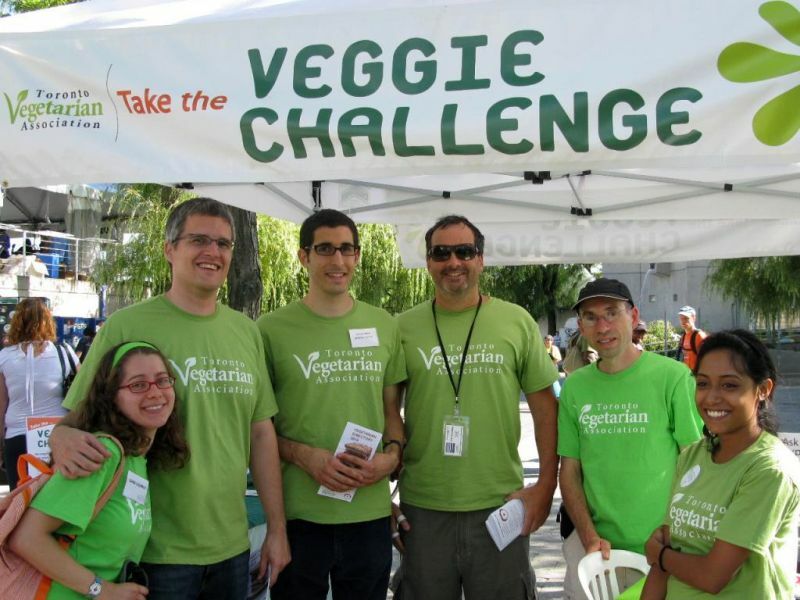 Pictures courtesy of “Luca” and the Toronto Vegetarian Association. How much protein were you getting on the vegetarian diet? Were you eating beans or dairy products? I would say that I was getting a lot of protein, I was eating beans and dairy ( at that time I ate dairy now I don’t cause it hurts my stomach ), I was also eating tons of tofu. I did all kinds of research and combined different foods to have a complete protein, but nothing helped I still felt hungry all the time and I ate quite a bit. Which is quite interesting, as there are multiple possible explanations for this. Is it in the digestion process itself or, as another example, the overall protein composition? I think it has to do with an individual. I’ve talked to some people who were like me, they tried being vegetarians and experienced the same things I had, which were lack of sleep and constant hunger. It probably had to do with how we ate when our bodies were developing. Nice n=1 experiment. There is evidence that at least 70% of those who try going vegetarian eventually revert back to their animal flesh eating ways, and most of the time for health reasons (http://www.psychologytoday.com/blog/animals-and-us/201106/why-do-most-vegetarians-go-back-eating-meat). Regardless, every long-term study that has compared vegetarian and omnivorous diets has shown no difference in all-cause mortality rates. For anyone interested I discuss these studies at length here – http://www.askscooby.com/nutrition/false-information-on-scooby%27s-site-regarding-vegetarianism/30/. Nice article, thanks for sharing your experience! I love Psychology Today, thank you for the links. Indeed, thanks for those links, Rani! Nice website, but I have to disagree when you say that vegetarians “I personally admire the vegetarian approach for the moral reasons, because most people who are vegetarians do it out of these concerns.” are actually saving animals and the Earth (you didn’t say it in these exact terms, but I’m still going to go on). Agriculture brings the destruction of forests and wildlife in general caused by the need for more space, while livestock(not sure on the correct term)needs less space, therefore, eating only plants will result in less diversity in nature, and more endagered species. Sorry for any potential mistakes( English isn’t my first language). Well, it takes cca. 10 kg of grain to raise 1 kg of beef. Yeah, but we eat grass feed cows, don’t we. Do you imagine how much pasture space does a single cow need + count the extra grassland needed to produce hay that will sustain it through the winter? I kinda sense that you don’t have a clue. But pastures are natural, aren’t they? Well, guess what, they are are not. Natural vegetation in temperate areas is forest, not pastue or lawn. They are “artificial”, just as a corn field is an if we’re talking about fertilised lawns even the biodiversity (or beter say the lack of it) is more or less the same. So, how can I say, your logic is just plain wrong. So, if you want to help the planet, take your copy of The vegetarian myth, take it to the loo and do some recycling (if you know what I mean). P.S. : I’m not vegetarian, vegan or living on prana. I’m a veggie and always feel tired… might introduce some of those veggies! I was purely veg several years ago until I ate chicken Thai with family and was never sicker. Decided to ease back to meat tolerance for social reasons. None the less a veg diet did give me incredible energy, which contributed to difficulty sleeping. Had to find some balance. Meat makes one feel heavy and probably helps sleep. Of course everyone is different, but yet I am skeptical of most claims that veg is ‘not right’ for an individual. If you lost weight, you were not getting enough calories. Period. If you’re not eating enough calories in plant material, you likely don’t get enough protein. When I started on a veg diet I remember my lunch plate was twice as volumous as coworkers’ and took me twice as long to eat. That’s to be expected. I think whatever rocks your boat is ok, as long as one doesn’t develop deficiencies. If someone is happy going veg, why change that? To me food has, beside the pure nutritional value, also a mental one: a satisfied soul is happier and healthier. If the boat floats, don’t rock it. But if the boat is sinking, we should be clear about the cause and solution, or jump ship, as the author did. Weight loss is not generally mystical. If we’re gaining or loosing weight on a new diet, we can bet the most significant factor is calories. If we’re feeling hungry: same thing. Can’t sleep? The poor girl was starving herself.